I was recently mentioned in the editor’s note to an article on CleanTechnica, Mercedes B-Class Electric vs BMW i3. The short point is that, unlike Car & Driver, I much preferred the Mercedes B-Class Electric over the BMW i3. New Mercedes B Electric — really nice!! Suicide doors and back seat room for a 6′ 5″ tall guy! LMAO! Debbie cracking us all up with her riff on how much nicer the Mercedes is. If getting “more attention when it came down to it” is important EV purchase criteria for you, ​definitely ​buy the i3. Then you can spend your savings getting help with that narcissism problem. When driven back to back, the Mercedes made the i3 appear like my Gem e2. … which is basically a glorified golf cart. We really wanted to like the i3. The salesman was awesome. He let us take the car for the afternoon, and the car drove great. And actually, I did like the car, but I feel the need to counterbalance the ​BMW bias of Car & Driver‘s conclusions (BMW a big advertiser? Someone own an i3?). If you only have 2 people, the BMW shortcomings are small. But when you move to 3, 4, or 5, it immediately becomes burnt toast next to the Mercedes B-Class Electric. 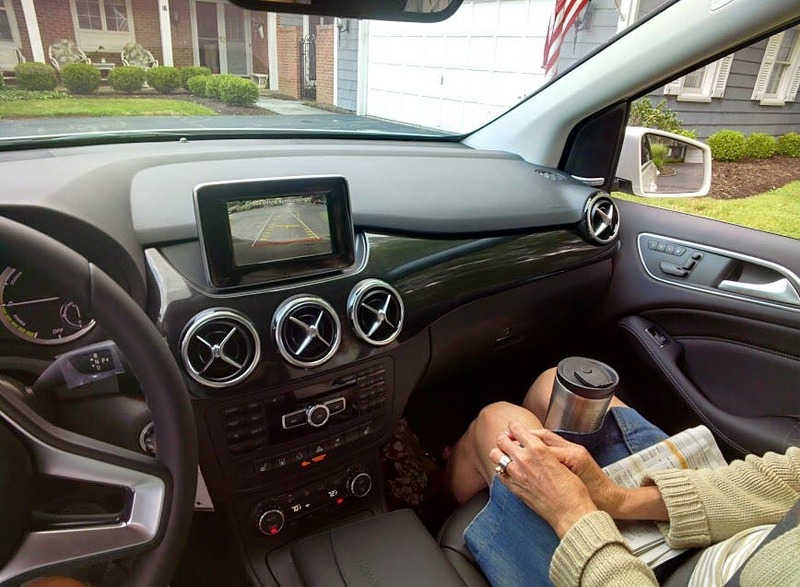 The Mercedes ​back seat is LUXURIOUS, even has fold-out trays. I used Glass to create a video of the BMW experience. (Unfortunately, I didn’t have enough battery to record the Mercedes test drive. Stupid, ugly, inelegant, cumbersome on/off/shifting pod behind the wheel. Deb had a hard time getting it started, and in gear. Take a tip from Tesla: when someone does something really well, imitate. Mercedes controls are the best. Park bench dash and door materials. Terrible/claustrophobic accommodations for rear passengers. Front seatbelt attached to rear door, further instilling the feeling of being trapped. Huge, ugly, inoperable window in back instead of something smaller that actually opens — FURTHER instilling the feeling of suffocating rear-seat passengers. Weird, pop-up mini iPad displays. An AMAZING interior with memory seats. Awesome rear-seat room and comfort. Nice, normal looking — huge improvement over previous ugly duck look. 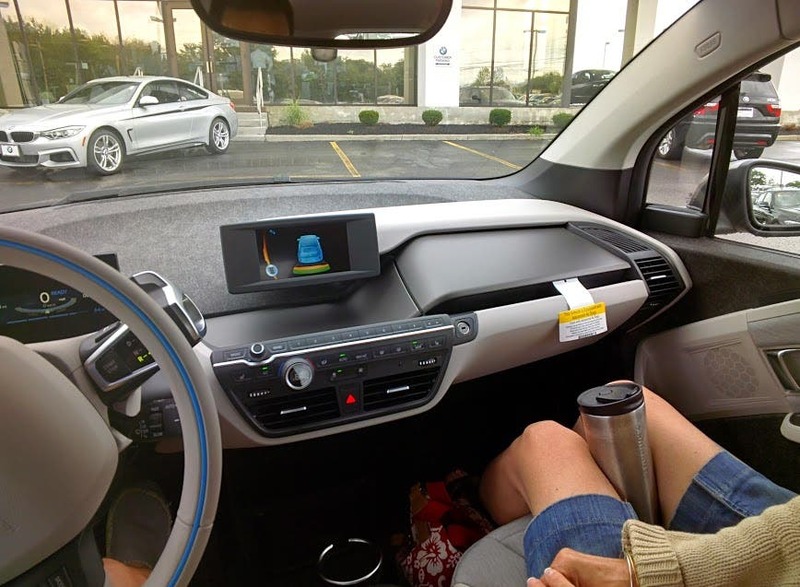 Great Mercedes/Tesla control stalks — improved for 2015! Smooth-adjusting cruise (better than Tesla). RANGE mode — the battery pack charges to 80%, range mode allows a periodic full charge, meaning this car CAN go 100–120 miles when you need it to. I didn’t like the iPad display on the Mercedes either. Or that it didn’t have keyless go. And I couldn’t get the cruise control radar to work. And I did like the ​more powerful ​regen in the BMW. I found the seats of both equally comfortable. The BMW is more “sprightly” (but it’s much less car). BMW had AWESOME modular cup holders, and keyless go. Ultimately I don’t like the weird for weirdness sake look​,​ or ​the poor design of that back door. The front seat needs a built-in seatbelt (like my ‘98 Dodge had) and the rear window needs ​be smaller and it needs ​to operate. Really, I liked both cars, possibly more than the Car & Driver folks did. But the Mercedes is so much nicer and more useful that I think Somebody didn’t do their readers justice with their BMW-biased commentary. 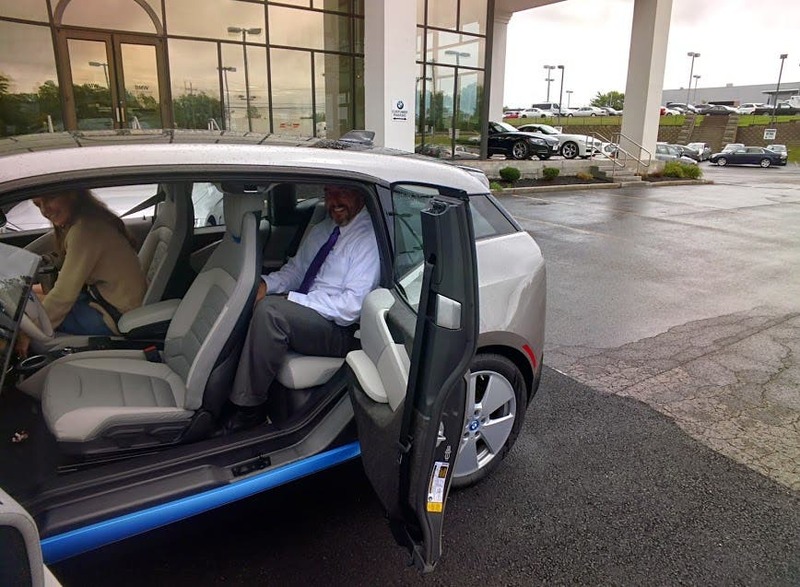 About the Author: Ted Kidd is a Rochester NY Electric Vehicle fanatic, Energy Activist, and Energy Efficiency expert in the residential and small business market. All images copyrighted by Ted Kidd.